Uddin, S., Löw, M., Parvin, S., Fitzgerald, G.J., Tausz-Posch, S., Armstrong, R. and Tausz, M. 2018. Yield of canola (Brassica napus L.) benefits more from elevated CO2 when access to deeper soil water is improved. Environmental and Experimental Botany 155: 518-528. Canola (Brassica napus) is an oilseed crop that is growing in importance as a vegetable oil, as well as a source of protein for livestock. Consequently, scientists are beginning to take interest in this species and they have begun to study its response to rising atmospheric CO2 concentrations and predicted future climate change. The latest research team to conduct such a study is that of Uddin et al. (2018), who grew two canola cultivars (Hyola 50 and Thumper) in a climate-controlled glasshouse at normal (~400 ppm) or elevated (~700 ppm) concentrations of atmospheric CO2 levels and under well-watered or drought conditions for two separate growing seasons. During the experiment, elevated CO2 was supplied in daylight hours only and soil water content was maintained at 90 and 50 percent for the well-watered and drought treatments, respectively. However, the drought treatment was not initiated until 40 days after sowing. In discussing their findings, Uddin et al. report that elevated CO2 "stimulated seed yield (38%), aboveground biomass (34%), root biomass (42%), leaf area (42%) and leaf biomass (41%)" (see Figure 1 for a visual depiction of the aboveground biomass and seed yield data). Not surprisingly, drought had a negative impact on canola growth. However, in one of the two cultivars (Thumper), the positive impacts of elevated CO2 were more than enough to overpower and fully ameliorate the negative impacts of drought on seed yield. And in the other cultivar, it was close to doing so. Given these observations, the future looks bright for canola production. Figure 1. 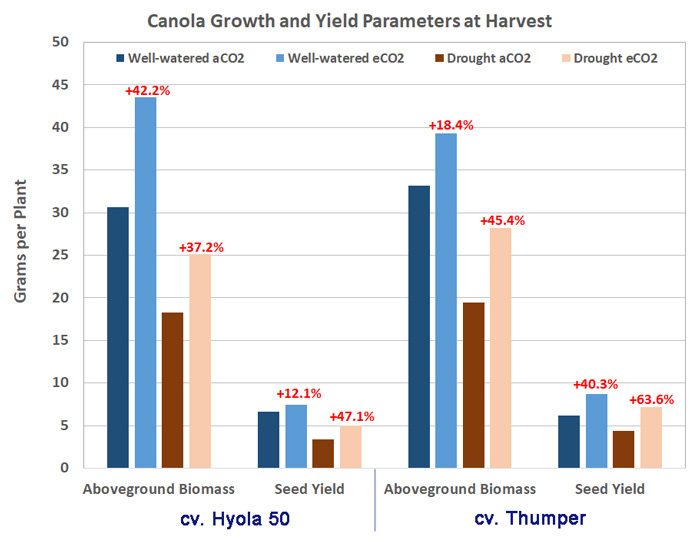 Aboveground biomass and seed yields of two canola cultivars grown under ambient (aCO2) and elevated (eCO2) CO2 concentrations and under well-watered or drought conditions. Plotted data are from the authors' Table 1. The percentages shown in red indicate the aboveground biomass and seed yield differences between ambient and elevated CO2 values under the two water treatment levels.